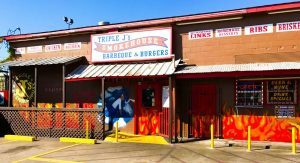 Triple J’s Smokehouse, Inc. (“the place” is what regulars call it!) was established in 1994 by Rhonda and Jarrett Scales on the north side of Houston proudly called Kashmere Gardens. Jarrett is a native Houstonian and a graduate of Kashmere High School. While at Kashmere he earned a scholarship in football and was recruited by Fred Akers in 1987 to play at Purdue University. He graduated from Purdue with a degree in Supervision in 1991 and returned home to open Triple J’s Smokehouse in the community in which he was raised. In 1996 they married and decided that Rhonda should come aboard and open the catering side of the business. 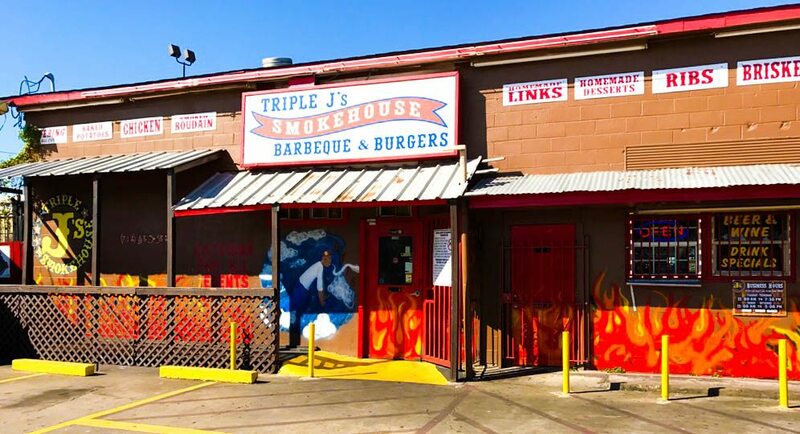 In 1998 Triple J’s Smokehouse made their debut at the Houston Livestock Show & Rodeo. In 2014 & 2015 they were awarded ribbons for Best Value Food at Rodeo Houston because their food is cooked fresh daily on site. A little known fact is that in 2004 the company was a participant and BBQ cooker at Super Bowl XXXVIII. Jarrett and Rhonda are the “peacock” proud parents of Jalen and Dylen Scales. The boys are active athletes at their schools and AAU basketball. 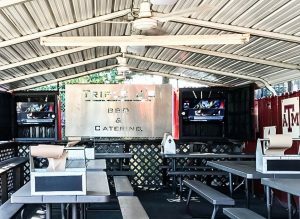 J and R give an abundant amount of credit for the success of Triple J’s Smokehouse to the awesome and amazing men that work with them. Cory Jones, Earl Brown, Jeff, Phipps, Monte, Rico, Freddie, Kevin, Tim, Duane, Lil’ Chris, and the newest guy, Sean. “The Guys” are the most important part of the daily operations at Triple J’s. They have twenty years of knowledge on smoking meat with nothing but post oak wood and fire and they make it seem easy! It’s obvious that they love what they do and Jarrett and Rhonda love and appreciate them for it!